Summary: Imagine Noah’s surprise when his parents pick him up from school one day, announcing that they’re leaving that night for a six-months stay in East Berlin where his mother will do research for her master’s thesis. Not only that, but there are a lot of rules to follow, starting with the fact that Noah and his parents will have different names (Noah becomes Jonah), and Noah’s mom has made up a photo album called the Jonah Book, showing a fictional past for his life so far. It’s 1989, and everywhere in East Berlin, people are watching and listening. As Noah’s family settles in, he starts to suspect that his parents are doing more there than helping his mom get her thesis done. He meets a girl named Claudia, pronounced Cloudia, and he nicknames her Cloud. 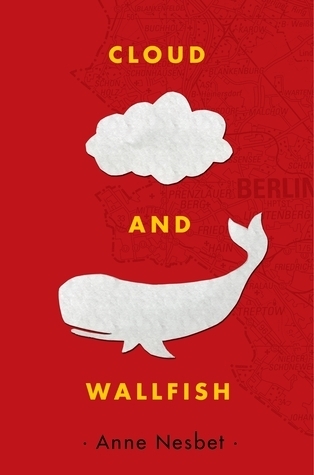 She calls him Wallfish after the German word for whale, a reference to his new name, Jonah. Cloud has learned that her parents have been killed in a car accident while traveling in Hungary, but she is starting to suspect that this may not be true. As 1989 draws to a close, events unfold very quickly throughout eastern Europe, and Noah, his parents, and Claudia are caught up in history as the Berlin Wall begins to crumble. 400 pages; grades 5-8. Pros: A fascinating story about an amazing time in German history. The reader sees events unfolding through Noah’s eyes, supplemented with “Secret Files” that give more history and reveal a couple of secrets that help explain what Noah is experiencing. A possible Newbery contender. Cons: Definitely a confusing plot; I was still unsure about Noah’s parents’ lives at the end of the story, as is Noah. Also, the “Secret Files” seemed like an easy way out to explain the background of what was happening, rather than weaving it into the story. This looks like a great one to check out. Interesting premise.